A Porter Cable c2002 review should discuss who will benefit from its numerous features. An air compressor will be a useful machine when a person wants to use pneumatic tools. Both contractors and home-owners will be able to make use of this type of machine. Before buying, it is essential to determine individual needs. It is important to understand how much pressure is available, horsepower, and other features. Here is a closer look at this Porter Cable equipment. 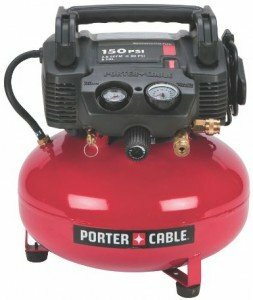 This Porter Cable air compressor delivers 150 PSI max tank pressure. It stores more air in the tank to allow for longer tool run time. There is 2.6 SCFM at 90 PSI, which allows for fast compressor recovery. It is essential to examine the CFM rating to make sure that the unit will be able to supply enough air for specific tools. This will assure that adequate pressure will be available to run each of the items. If a person needs to provide power to several pneumatic tools, it is best to choose a compressor that offers the highest pressure possible. This is a single stage compressor. It has one piston that delivers air to the tank. This is quite common on products that are made for home use. The air delivery SCFM@40 PSI is 3.0. The air delivery SCFM@90 PSI is 2.6. This Porter Cable c2002 review must include the amount of horsepower that is produced. The horsepower rating explains the amount of strength in the motor. It provides 0.8 HP. The tank size of an air compressor is important because it affects how long tools can be used before the compressor tuns back on. A tank size is usually rated in gallons. This particular model has a six gallon tank size. It will provide plenty of air to the user. The pump on an air compressor will definitely affect its performance. It is essential to explain in this review about the different pump options. An air compressor may include one or more cylinders to produce the compressed air. This particular unit is a single stage pump. It is also an oil free compressor. This means that it uses a special non-stick piston ring to lubricate the cylinder. Since no oil is needed, the unit will usually be smaller and lighter. This is why it is ideal for home use. The Porter Cable c2002 runs on electricity. This is extremely convenient, since it can be run from any normal electrical outlet. One of the biggest advantages of this kind of air compressor is that it will not give off noxious fumes. This makes it a good choice for indoor use. This air compressor has a low 10 amp 120 volt motor. It starts without problems in all weather conditions. It also does not require an extension cord. No one wants to purchase a machine that will be loud during use. This air compressor emits 82 decibels of sound. This means that it will not disturb the neighbourhood. Weight: This is a portable air compressor, so it is lightweight. It weighs approximately 34 pounds and can be carried easily from place to place. This Porter Cable c2002 review must discuss all of its features. To begin, the pancake style tank provides great stability. It also includes rubber feet and a water drain valve. It provides 150 PSI to get the most from the air tools being used. There are two factory installed air couplers that can support two users. The oil free pump provides durability with little maintenance. Finally, the unit is extremely easy to transport. The built in handle is convenient, and the included cover will protect important parts from becoming damaged. It is always nice to buy an air compressor that comes with an accessory kit. This product comes with a 13 piece kit including a 25 foot nylon hose, gun, and attachments. It also comes with a tire gauge, chuck, quick coupler, plugs, and Teflon tape. The best part of this Porter Cable air compressor is its portability. When a person needs a machine to run air tools for a home project or at a construction site, this unit will be ideal. The oil free pump will require little maintenance and add to its useful life. The 2.6 SCFM 90 PSI gives quick compression recovery time as well. The unit is quite compact and takes up little space when it is not in use. Finally, it provides peace of mind at purchase because of its one year limited warranty. There are very few negatives to mention in this porter Cable c2002 review. The only complaint of certain users is the fact that there is no wheels attached to the machine. However, since the machine is small in size and weight, wheels are not actually necessary. This Porter Cable c2002 has received four out of five stars based on 204 customer reviews. This displays how well it has been received by the public. It has performed very well and is a top seller. 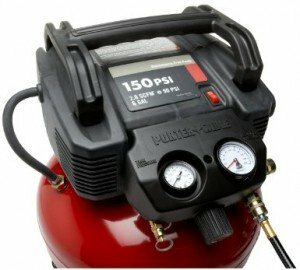 This Porter Cable c2002 air compressor is a small unit that comes with a small and affordable price tag. Despite its petite exterior, the frame is sturdy and durable. It manages to produce enough power and air to work tools when they are needed. The electric plug is convenient and the motor is easily started in all types of weather. The included kit will help to save money on accessories as well. In the end, this unit is highly recommended to anyone who is on a budget, but needs to have a source of power for air tools.